One thing you mention early in your post is certainly a part of the 'problem' in this situation: the fans. I've not seen all the Denver games since Tebow started, but in the ones I have seen, he hasn't seemed especially obtrusive with his faith. I admire the thoughtful and humble opinion shared in this posting. Mr. Tebow has certainly become a lightning rod for public opinion, and I too am pleased that he has not connected the theological dots that many have between God, football and statistics. Nonetheless, I wonder if we are asking the right question. Perhaps the question is not, "Did God cause Tebow to throw for 316 yards (as well as the other 316 stats)", but rather, "How might God use this string of events to bring about His Kingdom (which looks far less like watching football and far more like being His image-bearers)?" So perhaps there is some middle ground in all this debate. I was reading an article on Yahoo Sports (that bastion of Christian thought) and came across a brief article noting the "3:16 buzz" that has followed the game. The article indicated that millions of people had googled John 3:16 in response to all the buzz. I checked Google's search trends for Monday, Jan 9th and sure enough, John 3:16 was the most highly searched term/phrase for that day. 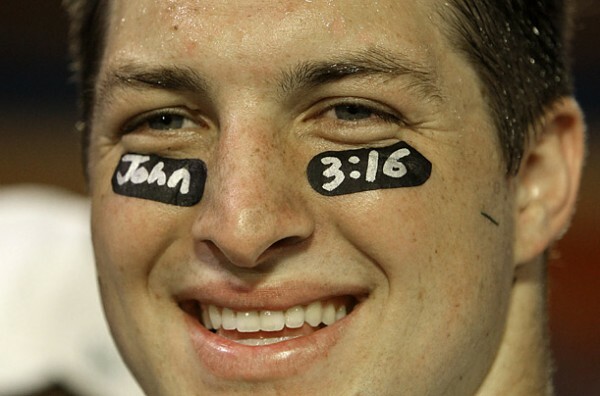 While we will never fully understand how God works, and while we will continue to under- or over-attribute God's involvement in human affairs, perhaps we can all agree that when millions of otherwise apathetic American football/pop culture fans google John 3:16, it is a good thing. It does not mean they will turn their lives over to faith in Jesus or grow into lives of discipleship through which the real problems you mention (poverty, global disaster) will be addressed. But perhaps God IS working in and through these fifteen minutes of Tebow fame, and perhaps we can agree that this is a good thing, so long as it is accompanied by the rest of us Christians doing our part to be salt and light when the curious Jn 3:16 googlers begin to look our way as well. The above was aimed at the blog by Dr. Byron. Forgot to mention that. Thanks for stopping by. Yes, I agree 100%. God can use this as well as the tsunami. For me that is a different question that seems to be on everyone's mind. But again, I wonder . . .
More God through Tebow references? Think revelation: Tebow is one of the Four Horsemen. The first of them actually. He rides a white horse (Broncos Mascot). The first horseman purpose is conquest/victory. Good thought-provoking points by all. The question I'm hearing in all of this is...Is God sovereign in his creation and what does one mean by "sovereign"? Does he CAUSE all things to happen VS. does he ALLOW (and use)all things to happen? Whether those things be success or suffering. Job comes to mind. Satan was the mastermind behind the suffering, but he did ask God for permission which he granted. God allowed it (with limitations), sustained his servant Job through it, blessed him with more family and wealth afterwards and was glorified in the midst of it all. God also addressed the various men's interpretation of the circumstances and upheld his right to work how he sees fit and be trusted whether he answers all our questions or not. He responded to Job this way even though the suffering wasn't initially his own idea. I believe this applies to success as well. I do concur, though, that this doesn't necessarily translate into God being behind all the stats of sporting events and that every mystical connection man can make or think they see God in is really his intention. But did he allow it? Or did some details of this life occur without his knowledge (or permission)? Does "coincidence" really exist? Not necessarily thinking of specific yardage there. Just questions I like to consider on a grander scale as well as in the details of life. My encouragement was of all, but the last comment. Not sure if you're being serious or sarcastic about the four horsemen. Well said John (on both accounts). Here was my response to fan interpretations of the stats: "Have we learned nothing from Harold Camping?" "What I think we ought to have learned from Mr. Camping is that our interpretation of events/numbers/etc should always be done in humility and with reverence for our position of finitude in reference to the divine mystery. I am certainly willing to acknowledge, within my particular faith framework, that God can work through 'mundane' matters (even football can be a sacrament!). Thus I am willing to aknowledge the possibility that God is working through things like this. I wonder, though, if some are willing to aknowledge the possibility that God is not acting thusly. Said differently, I prefer to deal in possibilities, doubts, mysteries, and humility, as opposed to certitudes based on historically located interpretations of the world." I just want to know why the good Lord does not love the Buffalo Bills. Thanks John! – I enjoy your posts. This one has had some interesting debate. I am reminded of the start of an anecdote by a favourite author – Anthony de-Mello. This challenges me because I often attribute a lot of shallow things to God – (such as my catching the bus when I’m late). However, where is God really working in my life? I think God is constantly giving me options (which I am often blind to) in the form of difficult situations that would enable me to grow towards him more. A made-up example would be a difficult friend who is both negative and clingy – giving me the opportunity to put into practice patience, kindness, compassion and love. If I grow through that and no longer have an issue then I can say “God is working in my life” – but often I just decline the opportunity and moan about it. It seems to me that each and every difficult situation in life is this sort of opportunity. That is where it begins to get a bit scary– because when I think of the greatest difficulties / sorrows in my life – well, who wants that sort of gift? I am not comfortable with what I think the answer is: because it makes God seem all the bigger and further away (though not less loving). It seems to me that Christians are called to actively embrace suffering. I think the question “Why didn’t God...” is a fair one, but I also think that within a loving community – like an extended family or closer, there are many such questions that don’t need to be asked. Maybe that sounds a bit offensive. I don’t think I’ve explained that at all well – but I think that is where a deep part of my faith is. I didn’t totally get what you wrote about praying for the missionary family in Syria, or for the Christians in the tsunami; did you mean ask for a miracle for only them as opposed to the wider community / non-Christians? maybe I misunderstand. In those instances a “miracle” would appear to favour a selected few – and be a miracle because the “grace” is directed at the in-group. This seems a bit exclusive to me. Thanks for all your work on these posts! "I think about the 16,000 or more people killed in last year’s tsunami in Japan. I wish that God would have miraculously stopped that wall of water even if only to save the Christians who were killed and to bring glory to himself." The latter part of this comment offends me, but I might understand why you would consider such an occurrence to be a miracle. However, can you think of another example in history (extra-biblical history) where a natural disaster killed everyone but the adherents of a particular faith? For me, this is also an example of a "small God". Sorry for the flames, but I just couldn't quite stomach this. I'm sure that you are a decent, moral, man. This particular qualification just bugged me. Fair enough. I had two things in mind here. 1) the biblical story of Abraham negotiating with God to save Sodom for the sake of the righteous people. 2) the fact that some people would interpret the Tsunmai as punishment for evil, but would have stopped it if there had been Christians there. But I admittedly did not flesh it out very well. I also had in mind a time when a certain evangelist "prayed away" a hurricane from the coast of Virginia and claimed that the hurricane moved because of his prayers. Of course that did nothing for the poor people in NY who did get hit. So in the end I do not know of any religious group being saved in a natural disaster. My comments were not well thought out. I will edit it them out, but I will leave my interaction with you here in case others saw it and wonder what I was thinking. I can't believe that I am writing a dear John Letter....LOL... anyway, I appreciate your insight and agree with you, considering all of the horror that faces Christians outside of U.S. borders. However, maybe, just maybe God does choose to reveal Himself on the stage of a football game, simply because Americans choose to spend more time and money in the seats of the stadiums as opposed to the pews of the church. Just food for thought. I like your post and agree with you completely, and also with the responder who wrote about Job. For Joy, I think it's important to remember that God does not send pain and suffering upon us. Bad things come from Satan, who has a degree of power of his own, and who is evil personified. If we have faith in God, he will turn our experience of those things into positive lessons that increase our faith and understanding. Those are the blessings. A person of great faith, such as Jesus or Dr. King or Ghandi, may choose to face evil head-on, for God's sake, knowing that suffering or death are likely to come, but there will be blessings long-term. There is evil in the world, because evil by definition is whatever is against the will of God. Satan's pride, willfulness and selfishness; Man's pride, willfulness and selfishness. Those things are evil. I think there is also what I call chaos in the world. The tsunami, the earthquake, the engine failure that makes the plane go down. I'm not sure whether those things involve evil. Only the Creator can understand the long-term workings of nature. I do think we should be careful what we mess around with!